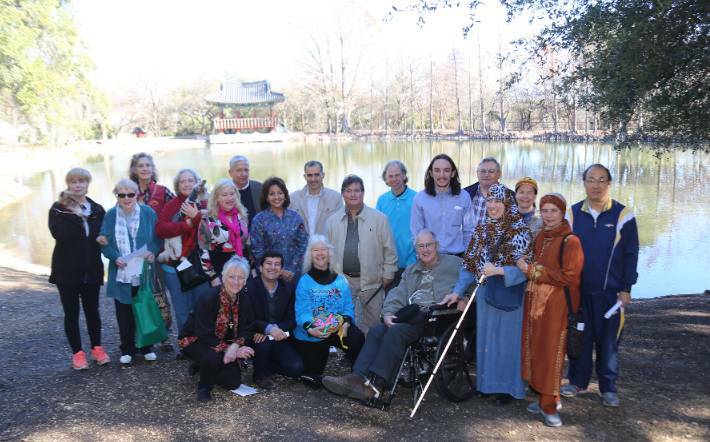 See a report about our previous World Interfaith Harmony Week, “TOGETHER Caring for Creation” http://worldinterfaithharmonyweek.com/detailed-report/?id=561 pictured above. 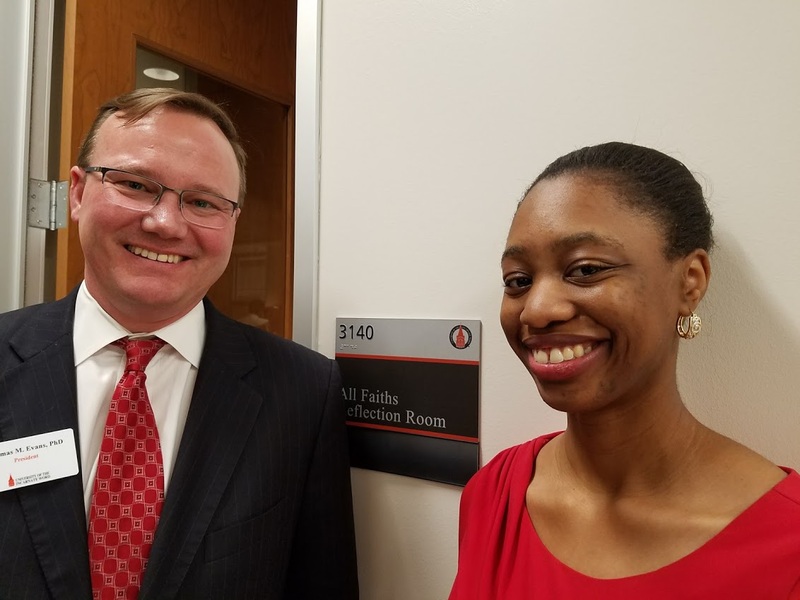 An “All Faiths Reflection Room” in the new UIW Student Engagement Center Building was named in honor of Adell Ferguson Polk, the first Black graduate of Incarnate Word College in 1956. Read a little about this fine woman http://www.uiw.edu/news/2017/2017blackhistory.html She was a woman of faith and dedication. 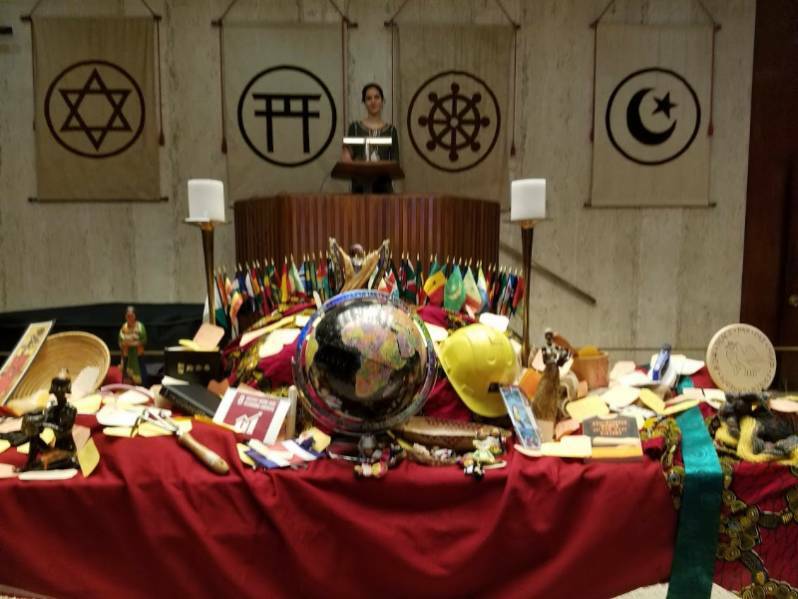 Please help spread word of the “All Faiths Reflection Room” which has texts from some of the major faiths, prayer rugs, chairs and a quiet peaceful atmosphere. UIW President Thomas Evans assisting in the dedication of the All Faiths Reflection Room in the new Student Engagement Center, Room 3140. 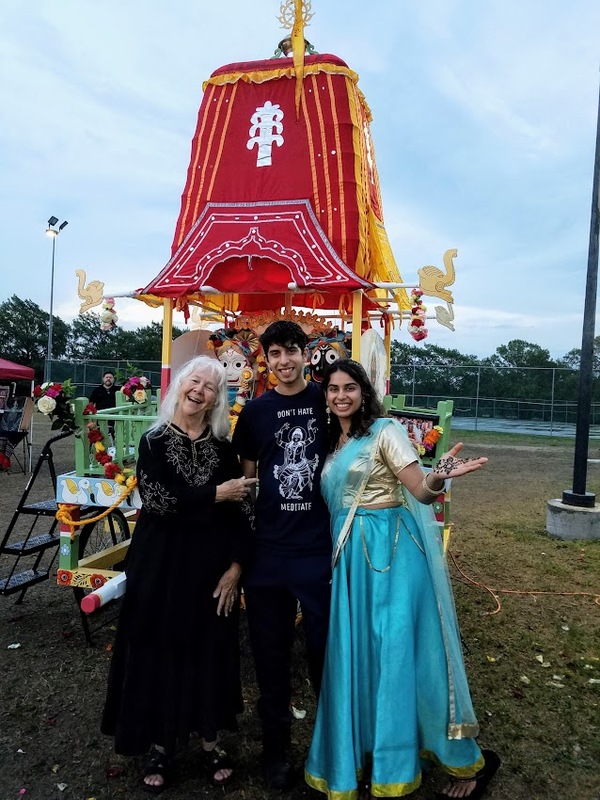 Sr. Martha Ann Kirk, Jay Mijagiri, and Jahnavi D. Mijagiri, a UIW student enjoy the Festival of Chariots, July 7, 2018, at Woodlawn Lake in San Antonio. His shirt says, “Don’t hate, meditate.” Ratha-yatra, or the Festival of Chariots, is a joyous event that has been celebrated for over 3000 years in the ancient holy city of Puri in Orissa, India, making it the oldest street festival in the world. The cultural festival consists of a procession when devotees pull huge festive chariots carrying Deities of Krishna while chanting and dancing joyfully, culminating in a “Festival of India” with entertainment, free-feast booths, and a variety of cultural displays and exhibits. 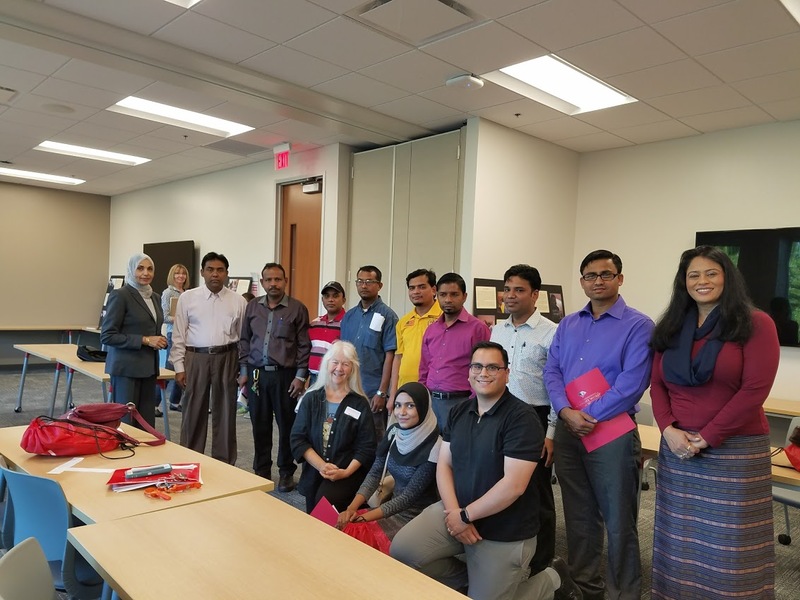 Members of the UIW community attended the Ramadan Dialogue Dinner hosted by the Raindrop Foundation, May 26, 2018. UIW has its first class of students in the new School of Osteopathic Medicine. Some of them and their Dean attended. The dinner commemorated Muslims’ holy month of Ramadan focused on fasting, works of charity, and prayer. 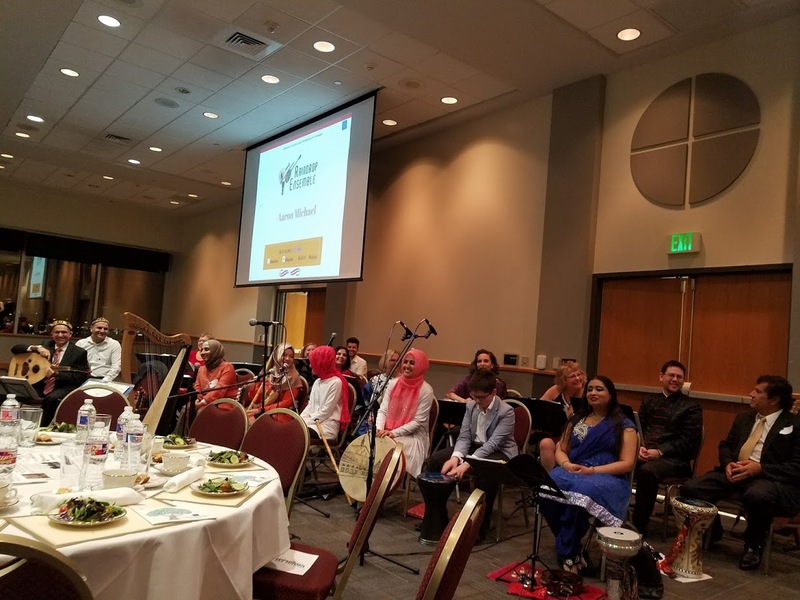 Participants had opportunities to make friends, listen to live Sufi music, and to learn more about the practice of fasting during the holiest month. Donations to help the SA Food Bank were encouraged. After sunset a delicious dinner of Turkish foods was served. 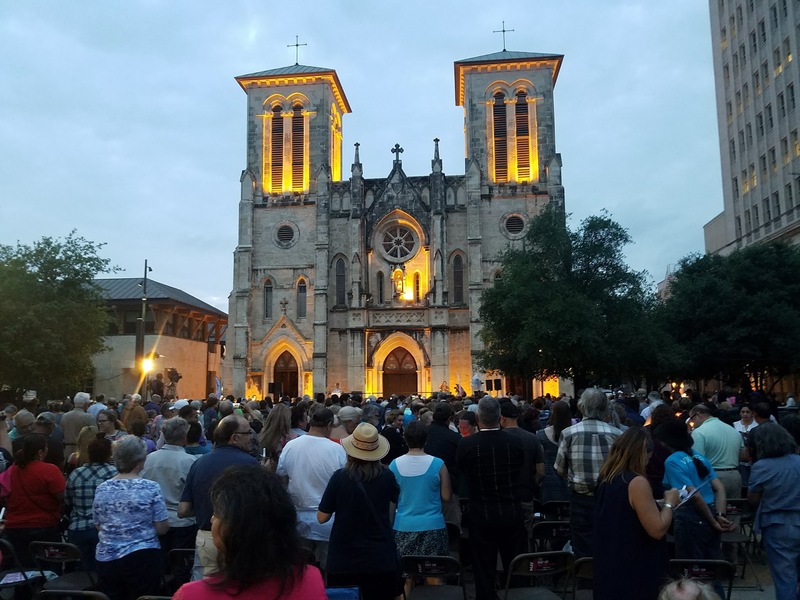 Leaders of over twenty different faith groups in San Antonio spoke at a gathering to remember the 300th Anniversary of the city of San Antonio, May 3, 2018. Native peoples began. 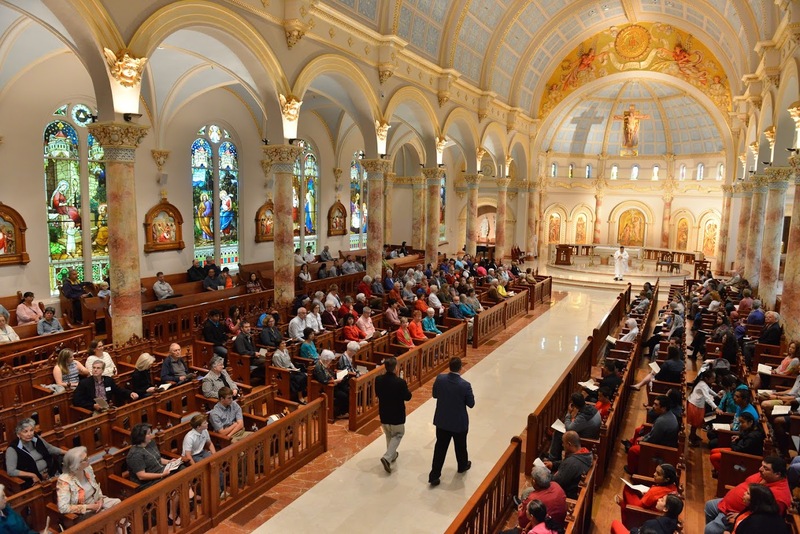 Franciscans bringing stories of Christianity were remembered. Major religious traditions from throughout the world are now part of the fabric of the city. San Fernando Cathedral seen in the background is the oldest cathedral sanctuary in the U.S. Faculty members participating in the Interfaith Youth Core Innovation Grant this past academic year focusing on Interfaith Literacy, Fluency, and Service presented how they and students learned and were engaged in service, April 24. Ideas for continuing and deepening interfaith engagement were discussed. “Peacebuilding in the Modern World” a Panel Discussion with Fulbright Scholars: Dr. Damira Sikhimbayeva from Kazkhstan, Dr. Sona Manusyan, Armenia, Dr. Emre Hatipoglu, Turkey, Dr. Kacper Tomasz Gradon, Poland, moderated by Congressman Charles A. Gonzalez, was held on April 19, 2018. “Interplay of Ethnic Nationalism and Islam in post Soviet Kazakhstan” was presented April 18 by Dr. Damira Sikhimbayeva, a Research Fellow at the Institute of Philosophy, Political Science and Religion Studies, Department of Political Science in Kazakhstan. She is currently a Fulbright Scholar at the Department of Anthropology, Texas A & M University. Dr. Sikhimbayeva obtained her PhD in Political Science at Al Farabi Kazakh National University in 2014. Her research interests include the impact of religion on the modern world, interethnic relations, and ethno politics. Dr. Dennis Gonzales, the Vice-President of CHRISTUS Santa Rosa Health Care and Dr. Thomas Evans, the UIW President carry the gifts in a Christian Eucharist for the Tricentennial Celebration. 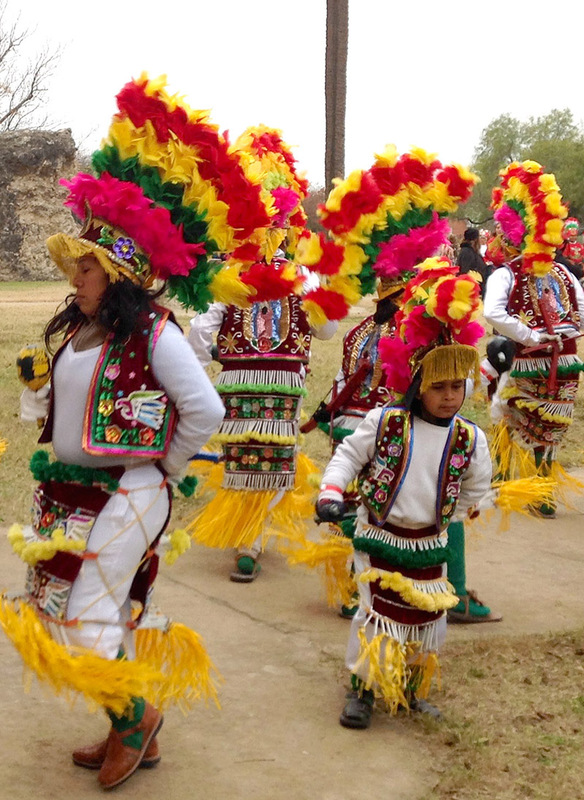 "Mi Casa Es Su Casa," an Incarnate Word Festival on April 15, 2018, during the San Antonio Tricentennial Year included interfaith and intercultural exhibits and activities www.sa300ccvi.org/festival The American Indians shared information on the meaning of the Medicine Wheel. 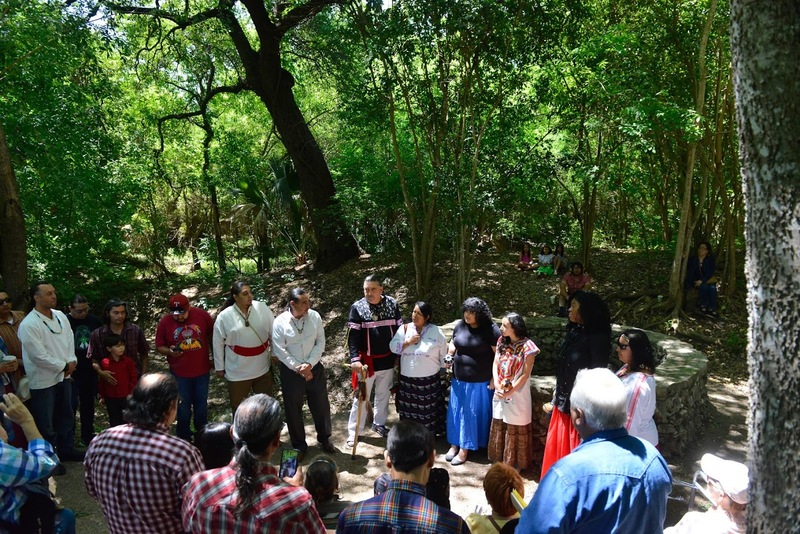 The "American Indians in Texas" shared a ceremony expressing gratitude for creation at the Blue Hole which is the place of the San Antonio Springs, the Headwaters of the San Antonio River. Matachines Led Prayer in Dance, April 15, at Our Lady's Grotto. The day included many intercultural and interfaith exhibits and activities including the “Interfaith Music Ensemble” from the Turkish Raindrop House. This group of Jewish, Muslim, and Christian musicians performs with Middle Eastern instruments and song. Turkish Folk-Dance was shared by students of the Harmony School of Excellence. Sister Martha Ann Kirk, UIW Professor, Rev. Ann Helmke, City Faith-based Initiatives Office, Rabbi Jeffrey Abraham, Congregation Agudas Achim, Archbishop Gustavo Garcia-Siller, San Antonio Archdiocese, Mr. Mike Oakes, Oak Hills Church, Rabbi Sam Stahl, Rabbi Emeritus of Temple Beth El, Rabbi Steven Gutow, New York University, and other Muslim, Protestant, Sikh, and Catholic leaders met as part of the Interfaith Leadership and Civic Engagement efforts. 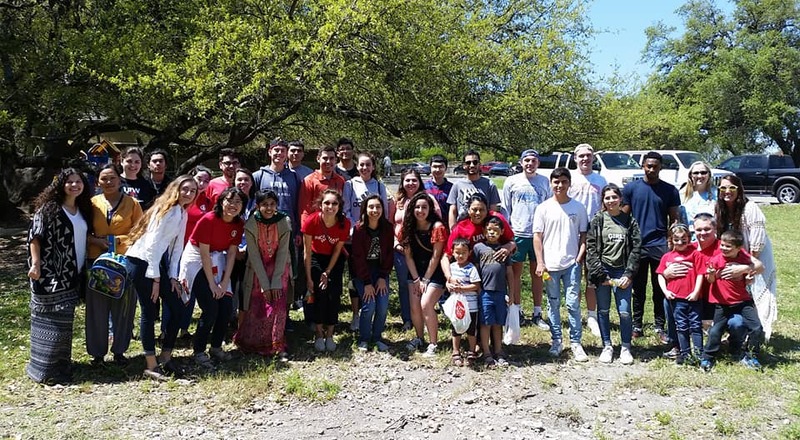 UIW is joining in circles of interfaith advocacy and service for “Affordable Housing, Homelessness, and Gentrification” with Jewish, Muslim, Sikh, Protestant, and Catholic partners. Rabbi Gutow is associated with the NYU program promoting local engagement in the face of needs https://wagner.nyu.edu/leadership/research/projects/public# A strategic plan for united efforts is being developed in light of the Mayor's Task Force on Affordable Housing. Learn more. 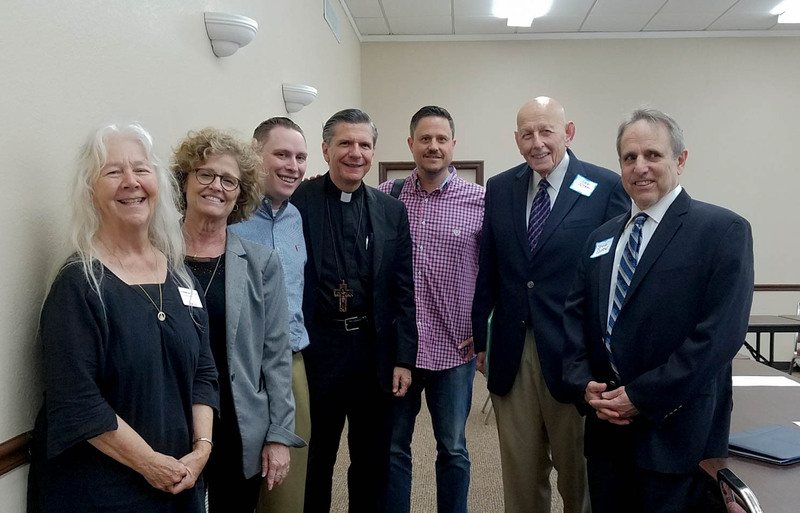 Both National Catholic Reporter and Religion News Service featured the story of this growing interfaith initiative, "After 50 years, clergy work together again in San Antonio, for affordable housing." Read more. The New York Jewish Week, one of the top three of the Jewish press in the US, published an article by Rabbi Steve Gutow about his work and what is developing in https://jewishweek.timesofisrael.com/faith-takes-a-stand-in-san-antonio/ Rev. Wyndee E. Holbrook has been selected as the executive director and Alamo Heights United Methodist Church has provided office space. 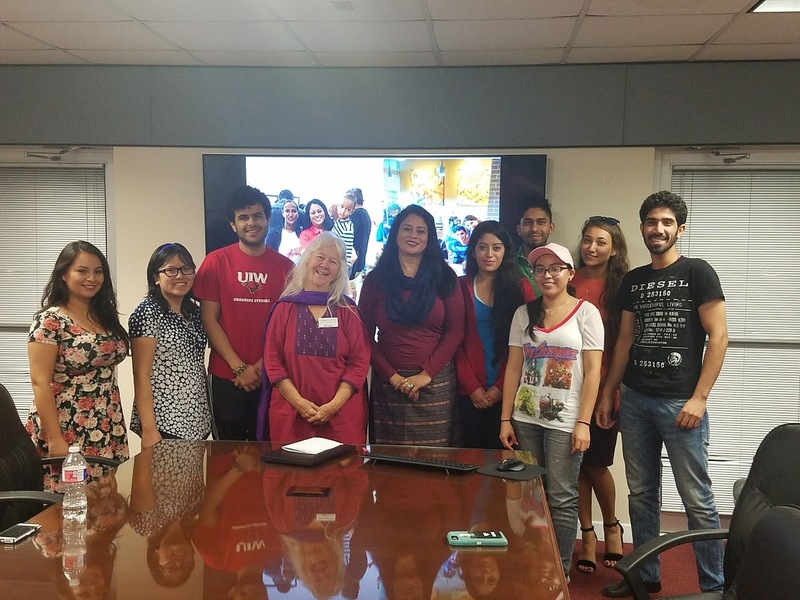 “Teaching Compassion and Making a Difference,” the 13th Annual Dialogue and Friendship Dinner and Award Ceremony was held March 3, 2018 in the UIW Rosenberg Skyroom. Acclaimed writer John Phillip Santos was the keynote speaker. Awards were presented to civic leaders and groups. Music was provided by the Raindrop interfaith ensemble of Jews, Muslims, and Christians,The evening was hosted by the Dialogue Institute of the Southwest and co-sponsored by UIW. Festival of Colors. 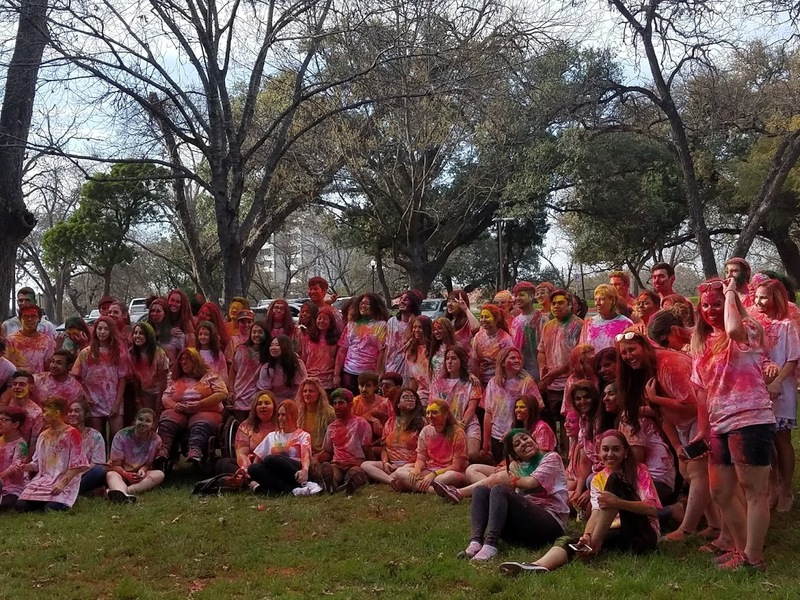 The South Asian festival of Holi was celebrated at UIW on Thursday, March 1 from 11:30 a.m., - 5 p.m., on Dubuis Lawn. 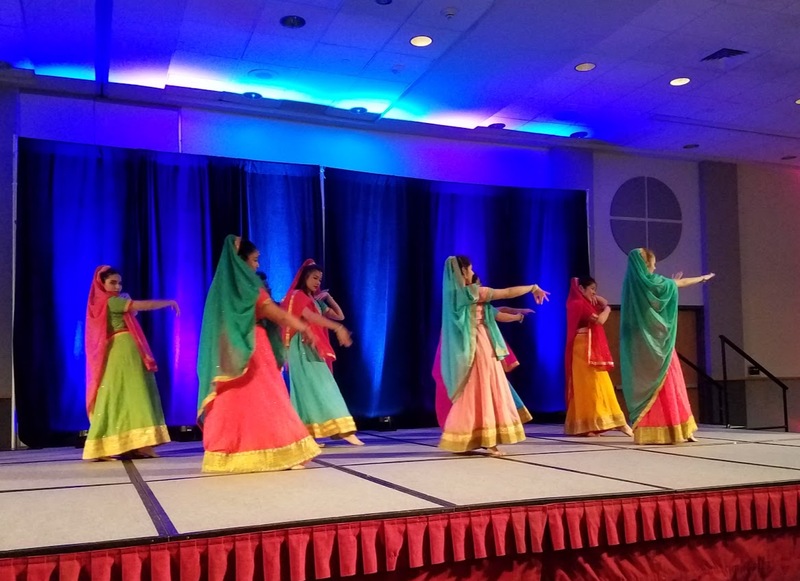 The Festival of Colors included not only the Holi color throwing, but also a World Market, cultural activities, live DJ, musical and dance performances from around the world, and free food provided by Pasha Express. This was co-hosted by Campus Life and Pasha Express. The University of the Incarnate Word joins communities around the world observing this special time designated by the United Nations. Thursday, February 1, 2018, an opening dialogue and reception was held in the UIW Library Special Collections. Muslim friends, Friday, February 2, 1 pm, Muslim Children Education and Civic Center, 5281 Casa Bella, San Antonio, TX 78249 www.mcecc.com. The UIW Alumni of Distinction Sarwat Husain who is a leader in CAIR hosted. Jewish friends, Friday February 2, 6:15 pm, Congregation Agudas Achim, 1655 Huebner Road, San Antonio, TX 78248 https://www.agudas-achim.org/ UIW Music faculty Dr. Orit Eylon cantored. Learning to serve together--Saturday, February 3, 11th Annual Community Service Learning (CSL) Conference, “Health Where We Live: The Role of the Neighborhood,” Health care as a collaborative effort. Prabhjot Singh, MD, PhD, Vice Chairman of Medicine for Population Health and Director of the Arnhold Institute for the Mount Sinai Healthcare System, presented wisdom gleaned from his global and domestic experiences in community health. He discussed his recent book Dying and Living in the Neighborhood: A Street-Level View of America’s Healthcare Promise. UIW Interfaith Conference sponsored by UIW Mission and Ministry, Friday, Oct. 13, 2017, Tynman Hall, Oblate School of Theology. Contact Rev Trevor Alexander and Brenda Dimas, dimas@uiwtx.edu P#: 210-829-3128. The first panel was shared by UIW students, Norah Al-Ladhal, a Nursing student from Saudi Arabia, David Rodriguez, Business Management student, Deju Keys, a Criminal Justice student, and Zane Alsareinye, a Psychology student who is president of the UIW Interfaith Student organization. Click here to read more including "Building on the Dream: Becoming the Beloved Community" shared by Dr. Raymond Blanton. Celebrating the South Asian holiday of Diwali: Festival of Lights at UIW! Nov. 1, 5 pm Photobooth and Henna, 6 pm Dinner, Puja and Performances, Rosenberg Skyroom, International Conference Center, Hildebrand at 281. Featuring South Asian cuisine, dance and musical performances, information on Diwali, and festivities! Cohosted by International Affairs, Campus Engagement. Special thanks to Dr. Sushma Ramsinghani and Dr. Lopita Nath. UIW students free.